Last year a few good friends and I were on a mission to track down beer advent calendars for our significant others. Upon discovering our common goal we decided to band together to find and ensure that the three of us will get our hands on the elusive and much sought after cases of beer. We had set up a group conversation on different social medias so that we could keep each other informed as to which liquor stores we've checked and which had yet to receive their shipments. One night, as we were joking about how our SO's owe us big for this, we mentioned how we wished there was an advent calendar for knitters. How fun (and expensive!!) 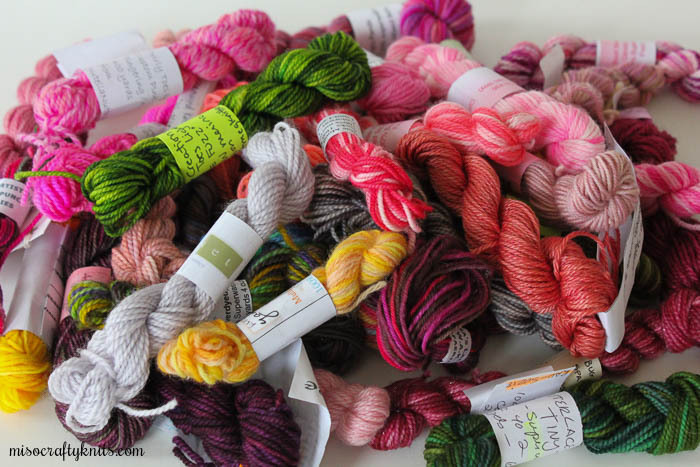 would it be to open up a new skein of yarn every day in December? In the past there have been a few designers that have offered freebies or different discounts on certain patterns each day, either on a solo effort or teamed up with other designers. There’s been KALs where a released-just-in-time-for-the-holidays pattern has been divided up into sections, which are then given out each day leading up to the big day. Last year Veera Välimäki produced her (totally awesome) Knit You Advent Calendar in which she released a whack load of new patterns - both freebies and for sale - as well as fun printables. But was there really a knitter's advent calendar? My Google-fu found nothing. As my friends and I were jokingly throwing ideas around about what a knitter's advent calendar should include, a lightbulb went off in our heads simultaneously. Seriously, no jokes. I have the screen shot in which we all came to the same conclusion and proposed the idea at the same time. 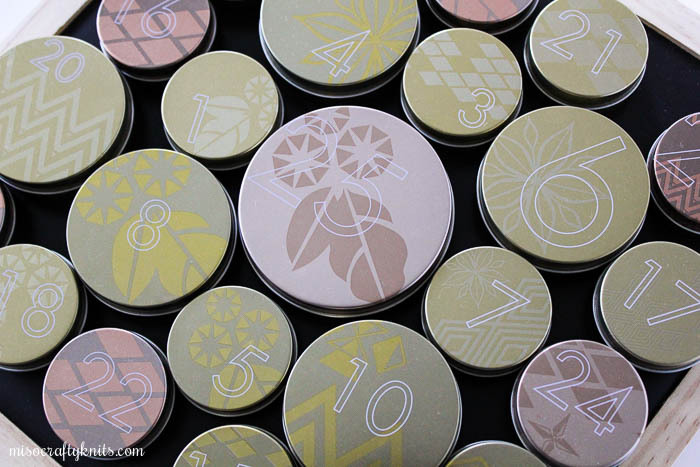 What if we created our own advent calendars?? For each other?? Our conversation took off and a plan was hatched. Oh yes, we were going to make this happen!! And make it happen we did!! Now, you're probably asking me why am I talking about putting together an advent calendar on the first day of December?? Well, for one, it's not too late to quickly put one together for a friend (and really, who would protest at having to open two items on day two? ); two, a lot of people have been asking how we sorted out who did what and if I can give any ideas or tips of how to put an advent together for next year; and three, a few people were thinking of putting together a Twelve Days of Christmas type advent. Excellent!! So how do we make a Knitter's Advent Calendar? First of all, how many people are going to be involved? If there's only two of people, easy peasy, all you need to do was shop for the other person. For my situation there were three of us. You'd think that would still be easy because all we had to do was draw a name out of a hat and you would have to put together that person's advent. The three of us kind of wanted to be a part of each other's calendar. My friend Arika had a brilliant idea and this is what we ended up doing: each person would have the odd days of one person and the even days of the other. To determine who had to do what days, we also decided that we were going to give a present to only one of the two on Christmas Day (so each person receives only one gift rather than two), and so names were drawn out of a hat as to who our Christmas giftee would be. To reiterate: the name you draw for Christmas Day would be the "odd days" person. I hope that all make sense! Next up, set a price limit. Decide whether you want to cap the amount to per day, person, calendar, or all together. This ensures that the exchanges are fair and prevents anyone from feeling guilty for over/under spending or from feeling like they got the cheap end of the stick. BUT also keep in mind that we're all makers here and the possibility that you'll want to make or that you'll receive a handmade good is quite high. So it might be a good idea to talk beforehand about whether or not if you want to include these handmade goodies into the advent and how they should be "priced". I know, I know...easier said than done. I know last year I didn't really put a price on the items I made just so that I could put more money towards purchased items (and I'm definitely NOT saying mine or anyone's handmade items are not worth anything!!). Last but not least, wrap up the goodies and don't forget to write down the day on each package! This year I made it easier on myself by designating a colour to each person and can tell immediately which packet belonged to which person. What to include in a Knitter's Advent Calendar? This is the biggest question of all. What items should you put in the advent?? I thought this would be the easiest part ever but then I realized, there are how many days leading up to Christmas? Ok...maybe not the easiest...but definitely the most fun part of putting together an advent. So my first tip: do a little research. I know, you may be thinking that you know your friend(s) really well but it doesn't hurt to find out if they prefer milk or dark chocolate...or even chocolate at all!! You may love chocolate covered cherries but your recipient might not (I personally find them gross). Madelinetosh's Unicorn Tails are all the rage but maybe your recipient doesn't have a use for them, or better yet, maybe they're collecting a certain colour range for a future project? It's these little tidbits of info that will really help guide you in the right direction for a much appreciated advent. It's really easy to get carried away but always keep your recipient in mind. Yes, that DPN holder is awesome and at the perfect price point but what's the point if you're giving it to a Magic Loop knitter? Remember, the items don't have to be all out extravagant, just thoughtful and catered to the person you're giving to (seriously, I'd be happy if mine contained nothing but chocolate, salted caramels, tea, and mini skeins!!). All of these points might seem overly obvious now, but once you get into it these points are easy to forget. Are you on a tight budget? There's nothing in the rules that say you have to buy each person their own full box of assorted teas or full set of fancy pens. If you buy in bulk you can break it up and divide it amongst the recipients. A lot of companies offer packages of mini assortments and/or include samples, which is great for trying out a product without having to fork over the dough for a full sized version that your friend(s) might not even like after trying it. Craft fairs, dollar stores (Daiso, I'm looking at you!! ), even your own stash and/or craft supplies are all great places to find some pretty awesome and wallet-friendly advent items. ♥ Stitch Markers - who doesn't love and need stitch markers?? This one is a no-brainer! If you're anything like me, I'm constantly losing, breaking, and yeah, I'll admit, due to the amount of projects I have on the needles I'm always using up all the stitch markers. So there's always a need for them for this knitter! This idea can be broken down and can expand to a few days depending on what kind of stitch marker the knitting recipient likes. Simple snagless rings, fancy charms, themed, there are so many different kinds to choose from! ♥ Locking Stitch Markers - while these markers could be grouped together with the markers mentioned above, I thought this one needed it's own category. After all, there's also several types of locking stitch markers available on the market now: plastic, plastic with clips (like the ones in the photo above made by Clover), lobster claw, lever hooked, and safety pin style metal bulbs that are very popular right now, just to name a few. We won't even go into all the different colours, jewels, and charms that could be added to these! ♥ Progress Keeper / Stitch Marker - we've all worked on those projects that require what feels like endless amounts of either stockinette or one particular stitch, and it seems like we've entered a black hole of knitting. Heck, I'm working on such a project now! A progress keeper will help you to visibly see just how much knitting you've achieved per sitting or day. It can also prevent you from whipping out your tape measure every two seconds to see how far you've knit. Basically, a progress keeper can save your sanity. Find one that has a charm that matches your friend and voilà! The most useful advent item ever! ♥ Tape Measure - I don't know a single knitter who hasn't spent time looking for a tape measure. Seriously. I think I have over a dozen and yet can only find one of them. Tape measures come in so many colours, sizes, price ranges, and forms, it's pretty easy to customize them to your recipients taste. Hey, you can even get a super simple one and then create your own sticker to stick to the non-button side. How fun would that be? ♥ Puppy or Kitty Snips - or any other teeny tiny small scissors to add to your friend's notions pouch/tin/case. Every knit night I attend there's always someone asking to borrow a pair of scissors! ♥ Blocking Pins - this is another knitty item that comes in different varieties. There's the t-pin, the fork, and the more delicate lace pin. Even though they're suppose to be rust proof, I find I have to throw out a pin every so often for that very reason. ♥ Post-It Notes - the usage possibilities for Post-Its is endless. They're great for making notes, marking your spot on charts, writing warm fuzzies and sneaking them into a friend's project page. Who doesn't love Post-Its? 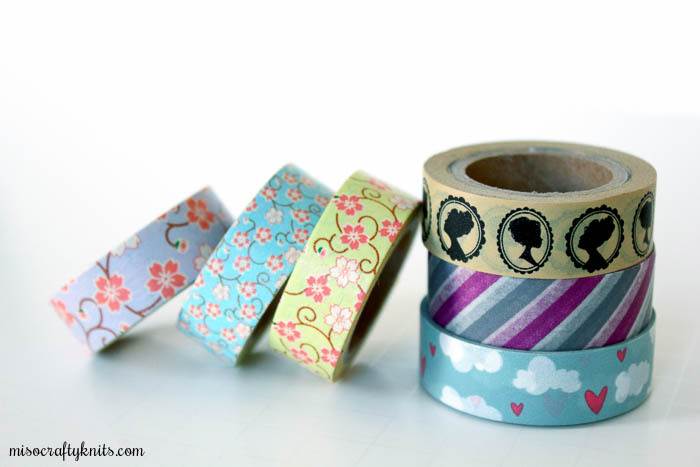 ♥ Washi Tape - another item that has endless usage possibilities, not only in knitting but in crafts and life in general. Keep track of your place in charts, secure the wrapping of a special gifted hand knit, tape your shawl FO to the wall...washi tape is a fun a decorative way to do it all. ♥ Highlighter Tape - some may think highlighter tape is only for lace knitters. Nope. While they are great for charts, they are also great for making sure you see those blasted "at the same time" spots in your pattern! Or for marking future projects or inspirations in a magazine or book. ♥ Highlighter Pen - this one is self-explanatory. Nothing new to say on this one other than the fact that you can get minis and different fun colours. ♥ Gift Tags - if your recipient has ever gifted any of their hand knits, gift tags - especially those that include a printed fibre content and care instructions - are greatly appreciated. You can customize this option even more by pulling out your craft supplies and making your own. ♥ Notecards - blank-inside notecards are the most versatile and just like the gift tags, is something that you can make, if you have the time and supplies. ♥ Needle Size ID Tags - not every knitter uses these, so these could be hit or miss. 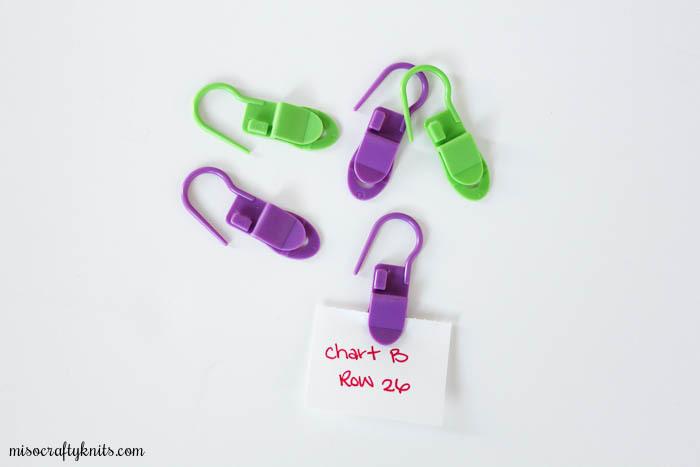 But if you've got an extremely organized knitter friend who has several projects on the go, Knit Picks carries these tags at a very good price. ♥ Chocolate - need I say more? ♥ Mini Skeins - or Unicorn Tails are awesome if your recipient has a sock yarn blanket in the works (like the Beekeepers Quilt), plans on making scrappy socks, or has any other use for them. You can either purchase minis or make them yourself from your leftovers. If you do a little research ahead of time you can find out which colours to look for or to avoid. If your friend doesn't plan on making hexipuffs, ever, but is a prolific sock knitter, then wind up enough sock yarn for contrasting heel, toes, and cuffs on a pair of socks! ♥ Wool Wash - I don't know of any knitter who doesn't need wool wash. This is a great time to try out new scents and/or brands. As I've mentioned above, there are a few companies that offer mini sampler packs of single use packets that are perfect for gifting. If you can't find those, super small bottles (like Eucalan's 100mL/3.3oz bottles) are easy to find in any LYS. Find out ahead of time if there are certain scents you need to avoid. ♥ Hand Lotion - just like the wool wash, sample sizes from specialty companies like Soak, are available. Or check out the travel section, independent makers, and even gift packs that contain small containers in groups of whatever for smaller sizes. Again, this is perfect to try out new scents and brands. ♥ Row Counter - this knitterly item is one of those things that can get easily lost in a project bag or unknowingly dropped on a coffee shop floor. You can get the ones that dangle off of circular needles or slide onto straights, and if you can catch them at a good price, you can also snag a digital row counter that you wear on your finger. ♥ Tapestry Needle(s) - another easy to lose item. Some companies, like Knit Picks and Hiya Hiya, offer packages of 3 needles for a great price. Or, if the budget allows, go for the ever popular Chibi set (the ones that comes in either the green or orange plastic tubes) per person or a handmade needle. ♥ Notebook - completely self-explanatory but is also an item you don't have to use strictly for knitting. This item is also perfect for customizing. You can glue or sew fancy paper or scrap fabric to the cover, or if you're strapped for time, washi tape it up! ♥ Pins - there are some really cute knitting-related pins (also called buttons or badges, depending on where you're from) out in the market right now, but some of the very best are by indie dyers and makers. Can't find the right one? Make your own! 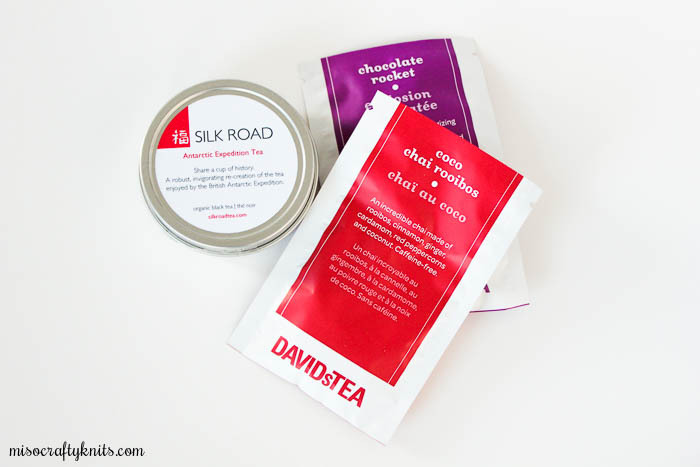 ♥ Tea - this is one of those advent items that you should really find preferences for in advance, as there are SO many different kinds of tea out there and in different formats (loose leaf, sachets, blooming, to name a few). I love going to my most favourite local tea shop (Silk Road Tea, in case you're wondering) and picking up mini-tins that contain 10-cups worth of tea. If that's not in the budget, bigger tea companies (like David's Tea and even Celestial Seasonings) have seasonal collections that you can break up and distribute accordingly. ♥ Coffee - this item might not be as easy to dish out as tea is, but is do-able if your recipients are fans of either Starbucks VIA and/or K-cups. You could also just as easily get a pound of coffee and portion them out yourself, but keep in mind that not everyone grinds their own beans or even knows what kind of grind their machine (or Bodum!) takes. ♥ Safety Eyes - got a stuffies maker as a friend? A package of safety eyes would be right up their alley then! ♥ Candy - there are some people out there that aren't chocolate fans (say what??) so fancy jelly beans, salted caramels, and gummy bears just might be a welcomed sweet treat! ♥ Lip Balm - I'm completely biased with this one, as I am a self-confessed lip balm fanatic! If you're so inclined, you can make your own pots or sticks and customize the flavours. If not, check out local makers, online indie makers (I'm looking at you, Unicorn Farts), or even big names (I highly recommend Hurraw!) that you can find locally. ♥ Keychain - this item can be either knitting-related or not. Think: emergency mini crochet hook, tiny wooden sock blocker, or one that has the instructions for the kitchener stitch printed on it. In a pinch? Make a mini and attach a keychain ring to it. Done like dinner! ♥ Buttons - knitters are always on the lookout for buttons, whether for past FOs or future projects. Building and having a nice button collection is great idea so why not add to your friend's jar? If you can't find the right buttons to gift, try making your own. There are some wonderful kits and tutorials on how to make fabric (and knit) covered buttons, or if you have the time and you're handy with wood work tools or polymer clay you can make your own from scratch. ♥ Small Knitted Items - think Bunny Nuggets, Chubby Chirps, Monster Chunks, Mochimochi Snowmen, little hearts, or anything from MochiMochi Land in general (hello, who would turn down a cute gnome??). Last year I received a mug hug that is not only well-used, but commandeered by the Mister! ♥ Mini Candles - like the lavender sachets, scented items like candles are one of those things that you either love or hate and majority of people have a scent preference for. When in doubt, just ask. ♥ $5 Gift Card to Favourite Coffee/Tea Shop - you can't go wrong with a GC to a favourite coffee shop! A perfect little something for when you're completely stuck and/or have one day left to find an item for. ♥ A Paid Ravelry Pattern - when in a jam you could always gift a pattern on Ravelry from the recipient's queue or wishlist. If you were following me on Instagram last year, then you probably saw all the goodies I received in my advent. If not, my friends and I are doing the calendar again this year and so you can follow along and take a peek at what this year's goodies are. I won't be posting a daily photo as I don't want to ruin the surprise and fun for the other girls, so I'll just be posting once a week (hint: most likely Sunday). Or check out the hashtag #friendmadeadvent to see what was in all of our calendars! If you have any more ideas, please let me know and leave it in the comments. I have a feeling this Knitter's Advent Calendar has become a new tradition with my friends and I would hate for my advents to become predictable!! And if you've made an advent for a friend or family member, let me know too! I'd love to see what everyone has come up with!! Oh snap! This is a creative and awesome ideas you and your homegirls cooked up. Can't wait to see what cha get. Melissa, this is a great list. Have fun with your knitter's advent calendar this year. this is such a great idea, how amazing!! love the ideas/suggestions for what to put in each day, too. Clever!! And great way to try some tools that you might not have before, like highlighter tape or a nice cable needle, etc.